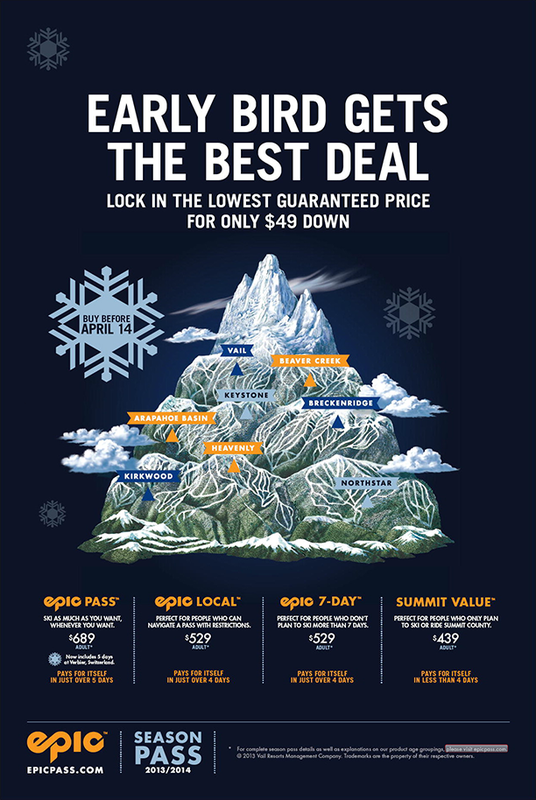 I’ve been fortunate to have a 30-year relationship with Vail Resorts (beginning at Keystone in 1983), so I was delighted to get the call from Brigette Schabdach of Spin Creative Studio: they needed a new illustration for Vail Resorts’ Epic Pass program. The project was exciting, but it was more constraining than a typical trail map. This ad campaign had been previously handled by another agency and the illustration painted by another artist. Vail Resorts wanted a similar feel, but they wanted the mountains to have a better resemblance to the actual resorts and have more of an actual “trail map” feel. 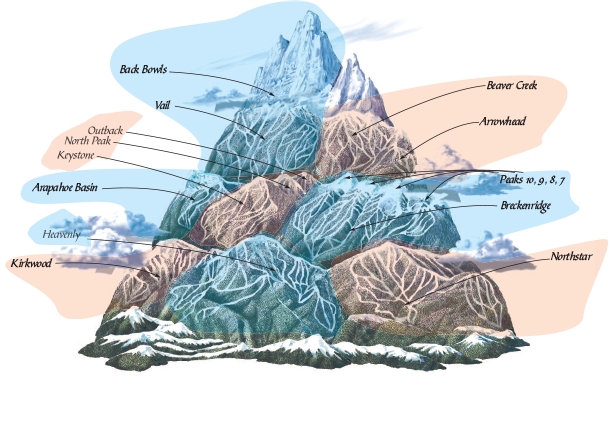 Over the years these resort trail maps have been painted by many different artists (James Niehues, Wilson-Lass, Gary Milliken, Terragraphics—and of course, Keystone and Arapahoe Basin are my maps), so there wasn’t one unifying style to apply to all. (James Niehues is the modern master—I’ll write about him in another post). So, I started with one small swatch to see if they liked the style. I went back to pencils in order to work out the hierarchy and relationship between the resorts. (Of course Vail gets top billing). 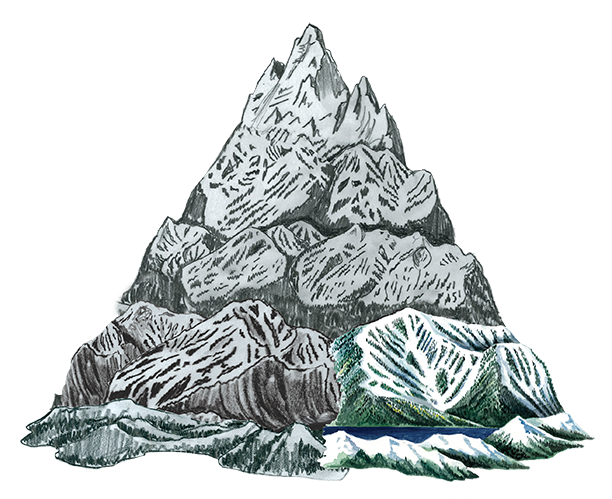 The Matterhorn-looking mountain in the back is kinda-over-the-top, but that’s what they wanted—so that’s what I do! My thought was to add a bit of “Mount of the Holy Cross” into it—not enough to be blatant, but enough that the locals could pick it up. I put this together as a guide to show the key components. 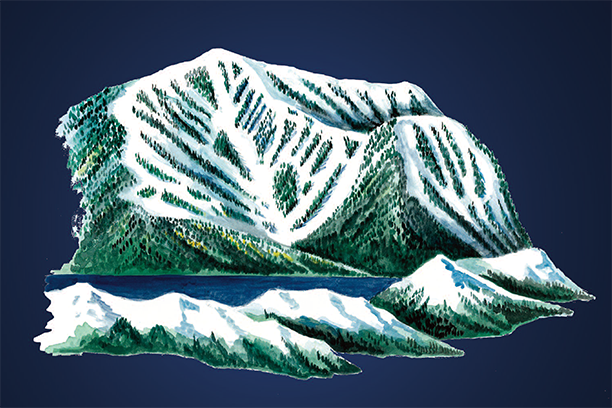 I also did a simpler variation for Kirkwood, Heavenly and Northstar, with Lake Tahoe in the foreground. I wish I were able to put my signature on these illustrations, but thus is the job of the commercial artist. Many people see my work—but few know who did it!